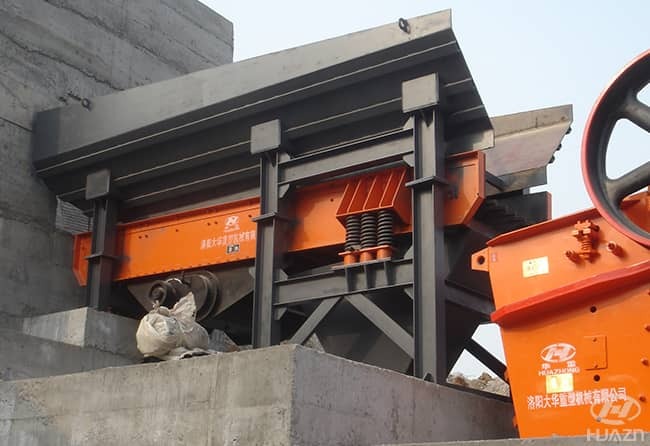 Vibrating feeder can feed the massive and granular materials from the storage bin to the receiving device evenly, regularly and continuously. In the sand and stone production line, it can feed the materials evenly for the crushing machine, and the materials can be screened coarsely. Vibration feeder is widely used in crushing and screening equipment in metallurgy, coal mine, mineral dressing, building materials, chemical industry and abrasive industry. 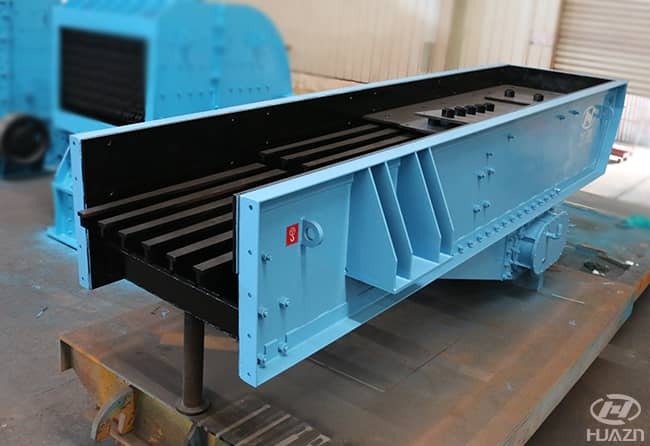 Performance of vibrating feeder: stable vibration, reliable operation, long service life; the exciting force can be adjusted to change and control the feeding amount; vibration motor is the excitation source, with low noise, less power consumption, good adjusting function, and no blanking phenomenon. It has simple structure, reliable operation, easy installation and adjustment, light weight, small volume, and convenient maintenance. Adoption of closed structure can effectively prevent dust pollution. ZSW series vibrating feeder is mainly used for evenly and continuously feeding for the coarse crushing, and meanwhile for screening fine materials to increase the crusher's capacity. The exciter works as the vibration source of the vibrating feeder which is composed of two eccentric shafts (driving shaft and driven shaft) and gears. The electromotor drives the driving shaft to rotate at high speed, the gear of the driving shaft engages with the driven shaft, and then the two shafts rotate together in the reverse direction that make the trough body moving forward the material continuously. When the material moves along the grizzly bar, the material that is smaller than the screen hole will drop down the gap between grizzly bar, thus realizing classifying.